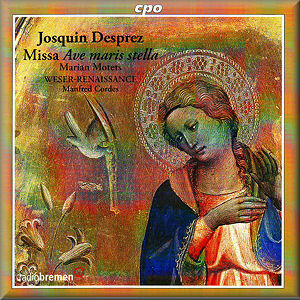 This music was composed early in Josquin’s career when he was singing in the Sistine Chapel and while the cult of devotion to the Blessed Mother was at its height. The simplicity, purity and clarity of the singing here is immediately apparent from the opening track, in which four of the eight singers used throughout sing the Vespers motet “Ave Maria” from which the themes of this paraphrase Mass are derived. Tuning is exquisite and the blend of voices unimpeachable. The difference in texture between the motets, when four or five singers are employed to sing each part, and the Ordinary of the Mass when two voices double up each of the four lines, creates a welcome variety in the density of sound. Special mention must be made of the lead Diskant (countertenor) Franz Vitzthum who soars without strain. If I have any criticism of the singing here, it is that the bass Ulfried Staber has a touch of the groaner - I could do with a little more sap in his tone - but in general Manfred Cordes has gathered here some of the finest exponents of European Early Music. I usually prefer a deployment of voices currently frowned upon by the purists such as the Tallis Scholars employ, whereby there are more voices, some women, per part, singing at a higher pitch - but in this case, the warmth, phrasing and musicality of the vocalists here entirely convinces me. The musical forms employed by Josquin are surprisingly varied: there are homophonic passages of stark simplicity alternating with complex polyrhythmic patterns and intricate melismata. Despite this complexity, the singers’ exemplary diction permits the liturgical text to emerge clearly. Cordes’ direction is free, flexible and fluid; no heavy-handed bar-beating here. Lovely though the Mass is, my favourite track here remains the first motet: the upward sweep of the opening phrase and the ensuing canon are enchanting in their simplicity, then the heavenly Ur-melody is sustained right through to the transcendent close, “O mater Dei, memento mei. Amen”. The sound engineering is admirable; just the right amount of air and space around the voices. The gold packaging is very attractive. The booklet provides Latin texts with German and English translations and a code to permit identification of which singers are singing what; unfortunately the notes tell you nothing about the music, only about the history and development of the Marian cult.